Sample storm drain runoff during the first significant rainfall of the wet season. During the first rainfall, water washes significant levels of pollution off street surfaces, driveways, and curbs and into storm drains. This concentrated mix of often polluted water flows directly from these storm drains into creeks, rivers and the Monterey Bay. 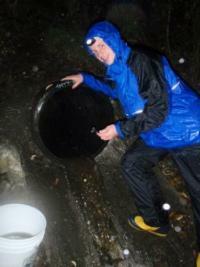 Volunteers monitor specific storm drains during the first initial runoff. Volunteers are trained to collect water samples that are sent to a professional lab to assess levels of non-point source pollutants such as nutrients (nitrate, orthophosphate and urea), metals (copper, lead and zinc), bacteria (total coliform, enterococcus and E.coli), hardness, and total suspended solids. Additionally, volunteers are trained to monitor water temperature, conductivity, pH, and transparency at the storm drains. Volunteers are trained to collect water samples and to monitor water temperature, conductivity, pH, and transparency at the storm drains. Website resources include background information on watersheds and monitoring, policy and science implications and links to data portal. First Flush results are compared to the Central Coast Ambient Monitoring Program’s (CCAMP) Action Levels. These action levels are not used for regulatory purposes. Rather, they provide guidance on potential impacts to the health of the marine ecosystem. First Flush happens in the fall each year - contact Debie ASAP to get trained in time to participate.